Macey's Electrical supplies a range of high voltage testing systems designed for insulation testing applications. 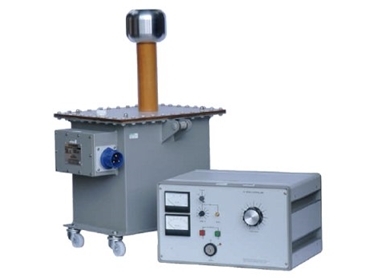 The KV30-100 and KV50-100 are high power, high voltage AC testing systems that are suitable for development and routine testing of electrical insulation systems. The high voltage testing systems consist of a control unit and a separate oil-filled high voltage transformer, linked by 5-metre supply and control cables. The control unit is fitted with a comprehensive range of facilities for control, metering and protection. Large, linear analogue instruments display the output voltage and current while a variable electronic trip is provided to allow the trip current to be set to 10-110% of rated output. The high voltage transformer is housed in an oil-filled steel tank fitted with swivel castors for mobility. The units use a high voltage bushing for the HV output, and the other end of the HV winding is earthed. Capacitive, resistive or inductive test objects can be tested using the KV30-100 and KV50-100 high voltage testing systems. 10kVA high voltage testing systems are available for higher voltage or output power. Models KV50-200 and KV100-100 are also available in low discharge versions.